The German cockroach is the cockroach of concern, the species that gives all other cockroaches a bad name. It occurs in structures throughout Florida, and is the species that typically plagues multifamily dwellings. 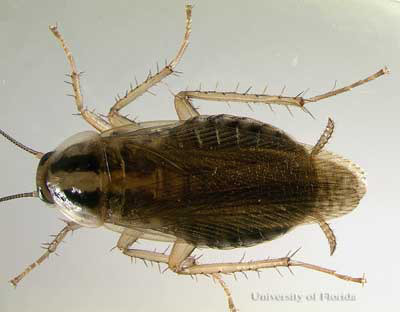 In Florida, the German cockroach may be confused with the Asian cockroach, Blattella asahinai Mizukubo. While these cockroaches are very similar, there are some differences that a practiced eye can discern. Figure 1. Adult female German cockroach, Blattella germanica (Linnaeus), with ootheca. Photograph by James Castner, University of Florida. The German cockroach is found throughout the world in association with humans. They are unable to survive in locations away from humans or human activity. The major factor limiting German cockroach survival appears to be cold temperatures. Studies have shown that German cockroaches were unable to colonize inactive ships during cool temperatures and could not survive in homes without central heating in northern climates. 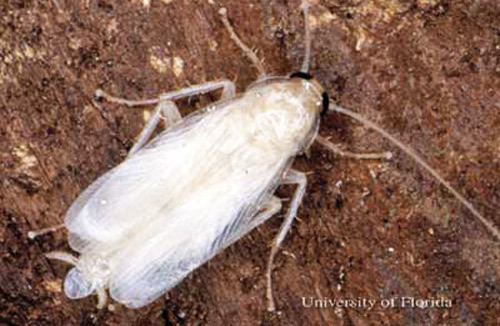 The availability of water, food, and harborage also govern the ability of German cockroaches to establish populations, and limit growth. Egg. Eggs are carried in an egg case, or ootheca, by the female until just before hatch occurs. The ootheca can be seen protruding from the posterior end (genital chamber) of the female. 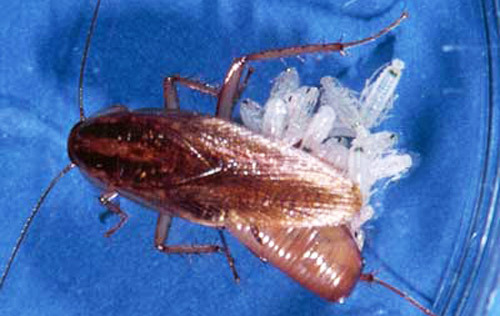 Nymphs will often hatch from the ootheca while the female is still carrying it. A typical egg case contains 30 to 40 eggs. The egg case is a tiny, brown, purse-shaped capsule. It is about 8 mm long, 3 mm high, and 2 mm wide. Figure 2. Oothecae (egg cases) of the German cockroach, Blattella germanica (Linnaeus). Photograph by James Castner, University of Florida. Figure 3. First instar nymphs emerging from the oothecae (egg case) of a German cockroach, Blattella germanica (Linnaeus). Photograph by James Castner, University of Florida. Larva or Nymph. The nymphal stage begins with egg hatch and ends with the emergence of the adult. Nymphs are dark brown to black in color, with distinct dark parallel bands running the length of the pronotum. Nymphs do not possess wings. The number of molts required to reach the adult stage varies, but the most frequently reported number of molts is six. The stage between molts is called an instar. At room temperature nymphs complete development in about 60 days. All developmental stages actively forage for food and water. Figure 4. Third instar nymph of German cockroach Blattella germanica (Linnaeus). Photograph by James Castner, University of Florida. Figure 5. Newly molted adult German cockroach, Blattella germanica (Linnaeus). Within a few hours the cuticle will harden and darken. Photograph by James Castner, University of Florida. Adult. The adult is 10 to 15 mm long, brown to dark brown in color with two distinct parallel bands running the length of the pronotum. The sexes can be distinguished by the following characteristics: male - body thin and slender, posterior abdomen is tapered, terminal segments of abdomen visible, not covered by tegmina (leathery outer wings); female - body stout, posterior abdomen is rounded, entire abdomen just covered by tegmina. Figure 6. Adult male German cockroach, Blattella germanica (Linnaeus). Photograph by P.G. Koehler, University of Florida. Figure 7. Adult female German cockroach, Blattella germanica (Linnaeus). Photograph by P.G. Koehler, University of Florida. The German cockroach has three life stages typical of insects with incomplete metamorphosis: the egg, nymph, and adult. The entire life cycle is completed in about 100 days. However, factors such as temperature, nutritional status, and strain differences may influence the time required to complete a life cycle. German cockroaches breed continuously with many overlapping generations present at any one time. Under ideal conditions, population growth has been shown to be exponential. Actively growing field populations are comprised of 80 percent nymphs and 20 percent adults. The German cockroach is omnivorous, eating table scraps, pet food, and even book bindings. Since the German cockroach is considered an aesthetic pest, the action threshold for this insect depends upon the tolerance of the people living in the infested dwelling. However, most people associate cockroach infestations with poor sanitary conditions and typically go to excessive lengths to eradicate them from their houses. Insecticides in the organophosphorous, carbamate, pyrethroid, amidinohydrazone, insect growth regulator, inorganic, microbial, and botanical classes are available for controlling German cockroaches. Insecticide treatments are available in a wide variety of formulations including baits, sprays (emulsifiable concentrates, wettable powders, microencapsulated), dusts, and powders. Insect Management Guide for cockroaches. Non toxic and low toxic alternatives for German cockroach control are available. Sticky traps can be used to monitor or reduce population size. Improving sanitation by eliminating food and water sources and clutter can have a significant impact on reducing the chances of infestation population size. Finally, exclusion practices such as sealing cracks and crevices will reduce harborage space and also negatively impact population size. Bennett GW, Owens JM. 1986. Advances in Urban Pest Management. Van Nostrand, New York. Cornwell PB. 1968. The Cockroach, Volume I. Hutchinson of London, London. Durier V, Rivault C. 2003. Improvement of German cockroach (Dictyoptera: Blatellidae) population control by fragmented distribution of gel baits. Journal of Economic Entomology 96: 1254-1258. Koehler PG, Strong CA, Patterson RS. 1994. Rearing improvements for the German cockroach (Dictyoptera: Blattellidae). Journal of Medical Entomology 31: 704-710. Rust MK, Owens JM, Reierson DA. 1995. Understanding and Controlling the German Cockroach. Oxford University Press, Oxford. Publication Date: September 1996. Latest revision: August 2008. Reviewed: December 2017.